We spent most of the summer travelling on the Alaska Highway and visiting Canada and Alaska. After a strenuous backpacking trip in the Yukon wilderness and driving the lonely and remote Cassiar Highway in Northern British Columbia at the end of July, Ian and I were looking for a more typical road trip experience. We were craving creature comforts, some easy hiking, attractions right off the highway (rather than 45 minutes down a potholed gravel road), and most importantly, some iced coffee! We travel mostly for free. Aside from the cost of diesel and maintenance on our Sprinter, we’ve paid for very little on our trip. We have yet to pay for a night of camping in our four months of travel. These stops are for the most part free as well, except for the cost of a cup of coffee or a drink. Additionally, we’ve noted some of the places that we parked overnight for free, in case you are traveling in a van or RV as well. No guarantees, but these are places that we parked without any issues. The Coquihalla Highway or the “Coq” (pronounced “Coke”) is the roughly 200 km stretch of Highway 5 from Kamloops to Hope. The highway is a high-speed freeway through a mountain pass. It is a critical route for truckers coming and going from Vancouver. There are steep grades, avalanche chutes that cross the road, cliffs prone to rock slides, and massive drop-offs right next to the shoulder. In winter it’s treacherous to drive, because the weather near the summit can change rapidly, but in summer it’s a beautiful drive through towering evergreens and granite cliffs, over gorges with the clearest water rushing through them. Ian and I got oddly obsessed with the TV show, Highway Thru Hell. The Discovery Channel reality show is about Canadian heavy-vehicle towing crew, Jamie Davis Towing, headquartered in Hope, British Columbia. The show follows the challenges of heavy rescue and recovery during the winter on Canada’s highways, primarily on the Coquihalla Highway. You never really think of how semi-trucks that have tumbled over cliffs on mountain passes are recovered, but Highway Thru Hell reveals the dangers of this type of towing--with just the right amount of passive aggressive Canadian reality show drama. We were just as captivated by the tow operators as we were by the recoveries. Also the show was randomly one of the few shows that we had downloaded to our phones while we were without cell phone service or internet access most of the summer. Get ready for tons of bugs if you are driving in British Columbia during the summer. Jamie Davis' tow yard with one of his big red wreckers. Outside Hope there is a beautiful country road surrounded by agricultural land. Toward the end of the road, near Jones Creek Forest Service Road, there are several wide pullouts that are perfect overnight spots. There’s a free campground up the forest service road, but it looked too rough and steep for the van, so we decided to just kick it in the valley instead. A hazy sunset, caused by smoke from wildfires, on Laidlaw Road outside Hope. After camping on Laidlaw Road, drive under Highway 1 toward the railroad tracks, and onto the end of the road, which is gravel, to pick some blackberries from bushes that are heavy with enormous blackberries. Or pick the juicy berries literally anywhere else. The blackberry bushes grow all over in ditches and other disturbed areas. In fact they are a highly invasive species here. Himalayan Blackberries are an invasive species in this region, and they are everywhere! When we first got into the Fraser Valley, we were so impressed by the bountiful berries that we picked almost seven quarts. That was maybe a bit much, but we made good use of the berries. Aside from eating our weight in the darn things, we muddled the berries in lemonade and added a little bit of whiskey for a summery and refreshing cocktail. Later on a cool evening we made a tasty jam from the berries. I think I may have been the first person in history to make jam in a Walmart parking lot. You probably don’t have the set up to actually can the berries in a van or RV, but making a small batch of refrigerator jam is really simple and pretty quick. Here’s a great small-batch, pectin free recipe. Look at the size of these berries! The jam that we made in a Walmart parking lot. Just outside of Hope is Coquihalla Canyon Provincial Park. 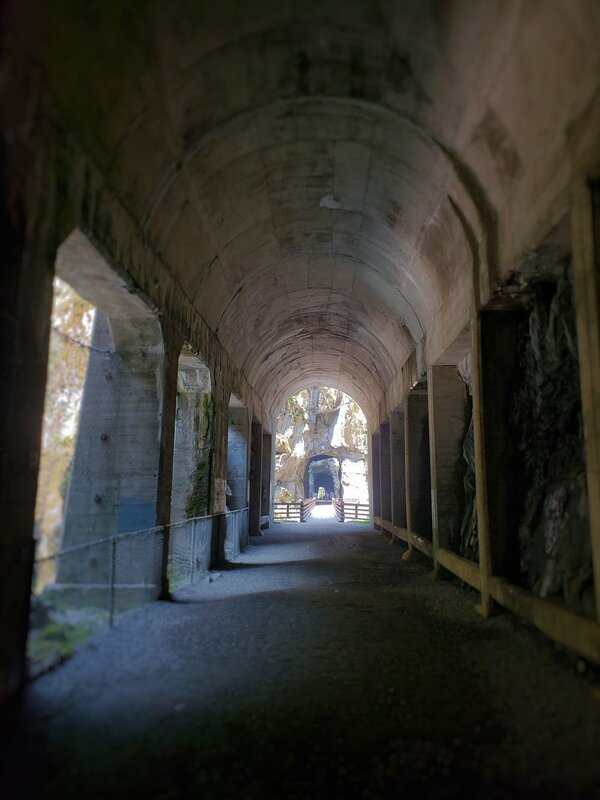 The park surrounds the granite river gorge of the Coquihalla Canyon, but the main attraction is five rock tunnels carved through the side of the mountain. The Canadian Pacific Railway built the tunnels in the early 1900s. The engineer of the tunnels was a big Shakespeare reader, so that’s how the tunnels came to be called the “Othello Tunnels.” Other stations on the route had names like Lear, Jessica, Portia, Iago, and Romeo and Juliet. The first tunnel is the longest and darkest. One of the tunnels has these cement pillars that give it a cathedral-esque feel. The tunnels are in a nearly straight line, so you can see through them all at once. Today the route has been converted to a section of the Kettle Valley Rail Trail, which you can actually bike on for nearly 400 miles, all the way from Hope to Castlegar. If you’re not looking to do an entire bike tour, you can just walk about 700m from the parking lot to the first tunnel for a total of about 1.7km to reach all five tunnels. If you want a bit more of a challenge, try the 5.4km Tunnels Loop. (I almost passed out while trying to do the loop as a trail run in 86-degree weather!) 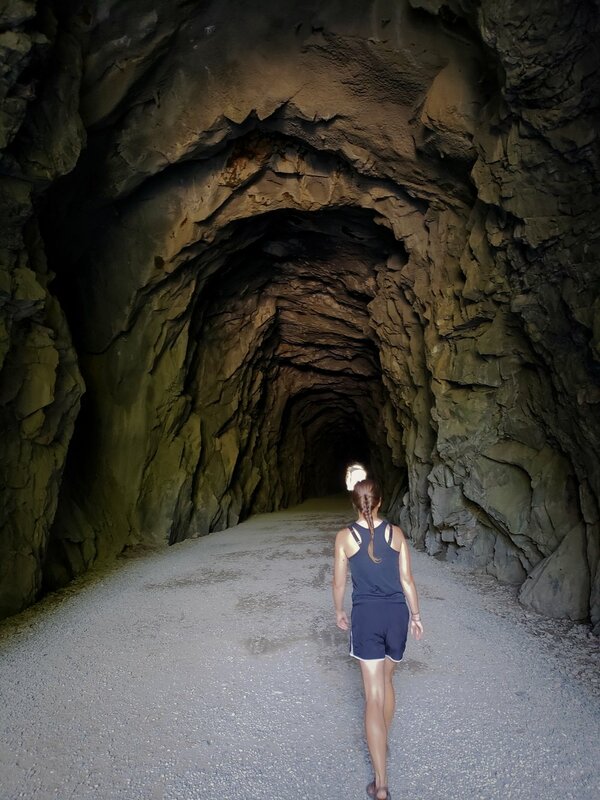 With over 1,076 feet of elevation gain, the single-track trail climbs high above the tunnels to an overlook of the valley, until finally descending back to the rail trail and the tunnels in the final kilometer. The Coquihalla Gorge is beautiful on its own, and the tunnels are the cherry on top. The view from the top of the 5.4 km Tunnels Loop. The gorge itself is beautiful--craggy cliffs with cedars growing absurdly out of them. At one point a trestle runs connects a gap between two tunnels, where you can see the river clearly below. The water is blue and crystal clear, and it has polished and carved the white granite rocks that surround it. The tunnels feel like they could be used to film a scene in Indiana Jones, and inside they are extremely dark and cool. It was really hot when when we were in BC. One evening when we decided we needed to cool down a bit, we stumbled upon SaraBella’s Gluten Free Café in Chilliwack. Nothing special here, but sometimes you just need a place to sleep and make some blackberry jam. We didn’t want to struggle to find parking for our 24-foot, over-height vehicle in downtown Vancouver, so we headed to a stop in a more residential area to get a view the city skyline and English Bay. Lighthouse Park is a beautiful park with a historic lighthouse and lots of great views of the bay. The park has a surprising number of trails for such a small area, that wind their way through old growth red cedars and Douglas firs. Most of the trails are winding technical single track on steep, rocky terrain. It's easy to forget you are in one of the largest metro areas in Canada. There is a bunch of cool old cedar shake buildings in Lighthouse Park. 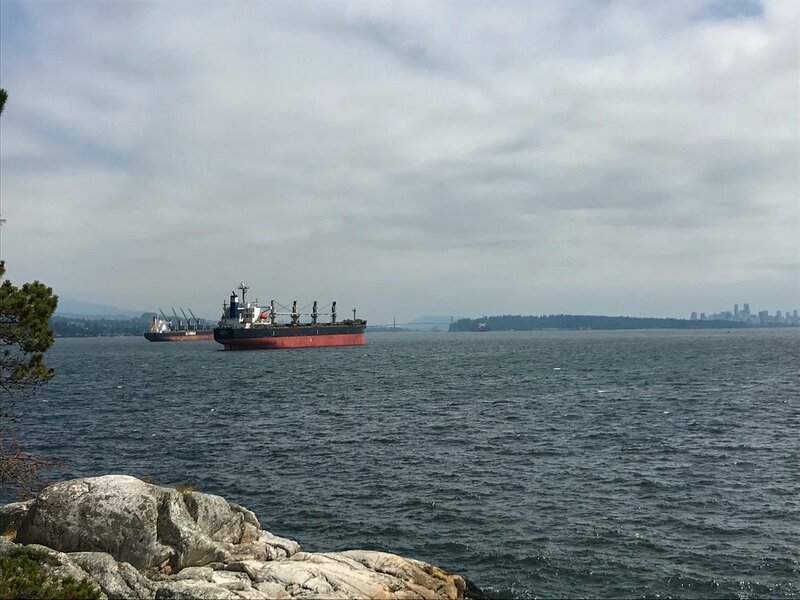 Cargo ships coming to port in English Bay outside Vancouver. The main viewpoint for the lighthouse is neat, but be sure to check out the view from the West Beach Trail for an even more picturesque look. Also don’t miss Eagle Point where you can see the Vancouver Skyline and big cargo ships coming to port. Take the Valley of the Giants to Eagle Point to see massive, ancient trees along your way. The view of the lighthouse from the West Beach. This highway from Vancouver to Pemberton is even prettier than the Coquihalla. On the southern portion the road follows the eastern edge of the Howe Sound. The northern portion goes through incredible granite peaks that are world-class climbing destinations. Skip the swanky resort towns of Squamish and Whistler (picture Aspen and Vale), and just enjoy the natural scenery and the many free provincial parks along the way. Just off the highway is an astonishing waterfall where the water pours gracefully over a 210-foot rock overhang into a clear blue pool. You also can get great views of super-blue Maisy Lake from the same trail. 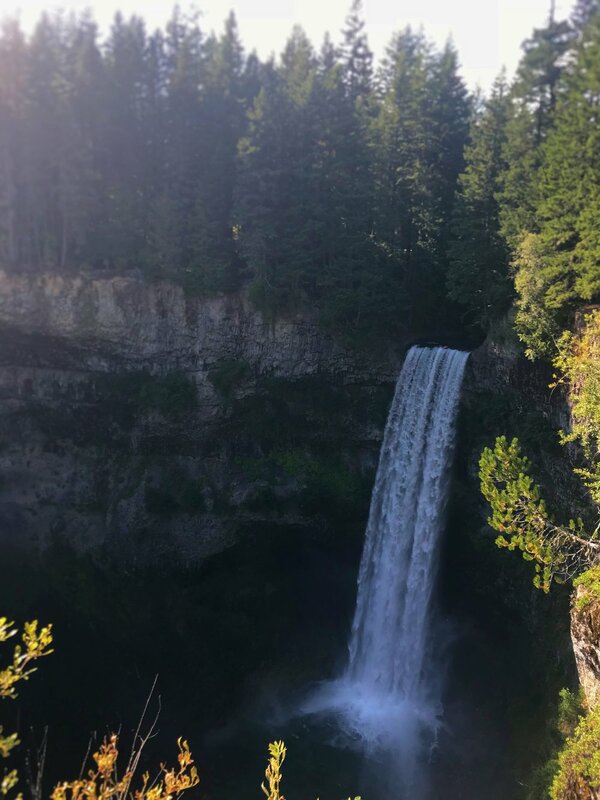 The view of Brandywine Falls is from a trail that overlooks the waterfall, but when we were there, there were people swimming in pool beneath the waterfall. The bottom of the falls could probably be accessed by taking a boat across Maisy Lake and then hiking upstream until you reach the falls. Brandywine Falls is a picture perfect waterfall. Ian takes a look at Maisy Lake. Across from Joffre Lakes Provincial Park near Pemberton, there is a large unmarked overflow lot. We parked there without any trouble, although the main lot does have signs prohibiting overnight parking. 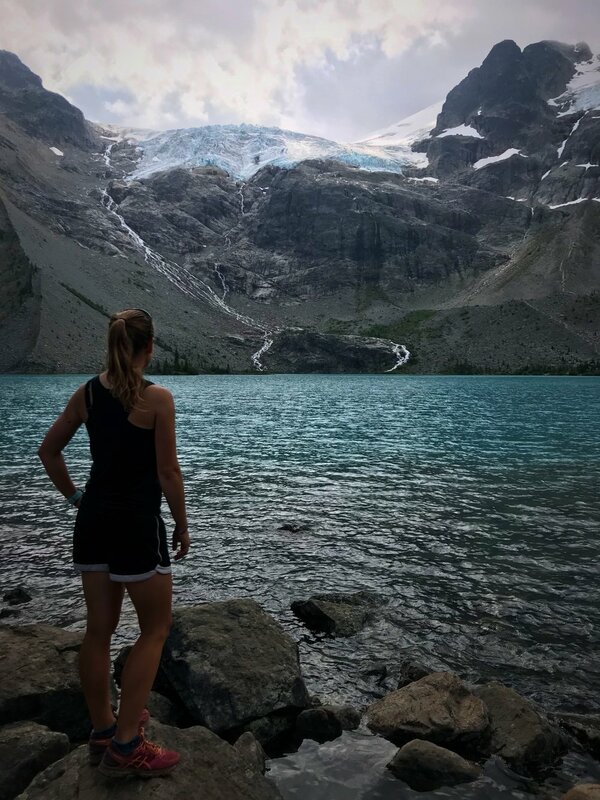 Not just one, but three gorgeous, turquoise, glacially fed lakes will greet you along the trail in Joffre Lakes Provincial Park. Both the Middle and Upper Joffre Lakes offer stunning views of the hanging Matier Glacier. Joffre Lakes is one of the more popular hikes in the area, and it's obvious to see why. The hike is really accessible. The first milky blue lake is literally right at the parking lot. The trail is wide and not too rocky until you get right next to the third lake, where the texture is a little rougher. The hike is only about 5 miles round trip. It’s easy to get there too, since it’s just off the paved Highway 99. This is a really popular hike, and there were tons of families on vacation doing the hike. There is a primitive campground near the third lake, so there were people backpacking as well. We spent the night across the road from the park, so we got an early start, but when we got back the parking lot and the overflow lot were filled, and people were starting to park on the shoulder of the road. Ian poses for a shot with our hydration pack by the turquoise waters. The Matier Glacier and its streams--the glacier feeds the three lakes and gives them their color. Our solution when there are lots of people but we still really want to see a beautiful place: trail running! You move through the trail faster—most people complete the hike in about four hours when walking, but it only took us an hour and a half. That’s less time dealing with selfie sticks, carelessly swung trekking poles, and being stuck behind large, slow and oblivious family reunions. You still get to see all the lovely sights everyone else is there to see. People seem to share the trail better when you’re running rather just hiking at a faster pace. Even though the trail is the perfect surface for trail running, five minutes in it starts to climb. You’ll gain almost 1500 feet of elevation gain over the next 2.5 miles before the trail levels out around Upper Lake. Doing the hike as a trail run, adds some challenge to the hike. Climbing that much in the dog days of August, we got pretty hot. At first we were just going to dip our feet in the middle lake on the way back. Then we witnessed another tourist fall off the end of the log into the water while taking a selfie. We were inspired to take a more intentional dip in the icy water. It felt great, and I actually went in twice. We’d highly recommend taking a quick plunge. Plus if you’re a vanlifer, it doubles as a shower. Witnessing someone fall off a log into the lake while taking a selfie will lead to a humorous series of photos. The water was really icy. We crossed back into the US on a Friday afternoon. That is a bad idea on it’s own, but then we learned that it was also a long weekend for Canadians. The wait to cross the border near Vancouver was over 90 minutes. Before crossing the border, we decided to pick up some iced coffee. We just randomly picked the Rustic Rooster Café in Cloverdale, BC, near the border. The mocha cold brew was really tasty, and the place was sunny and comfortable. We definitely would have tried to wait out the long lines at border crossing there if they hadn’t been about to close. The owners were really friendly, and we even ended up showing the van to one of them. This is a great stop if you just need a place to hang out or get some WiFi. We waited 90 minutes at the border, before a cowboy-hat donning customs agent checked our passports, opened the back and side doors, asked if we had a business card or a website about our van build because he liked it, and then waved us through. After that we wanted to be off the road. We took the first exit and found ourselves in the adorable seaside town of Blaine, Washington. After stopping by the visitor center to get some maps, we went to the Paso Del Norte for some Mexican food. Unsurprisingly, we hadn’t really been able to find many Mexican restaurants while driving the Alaska Highway, so it was something we had been craving for a while. We couldn’t even find corn tortillas, a major part of our normal diet, at most grocery stores! 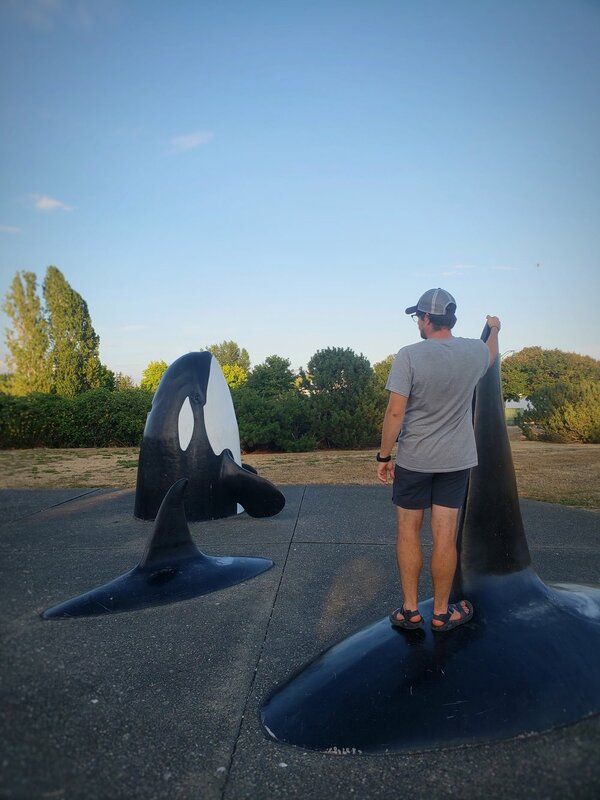 Orca sculptures in Blaine Marine Park. 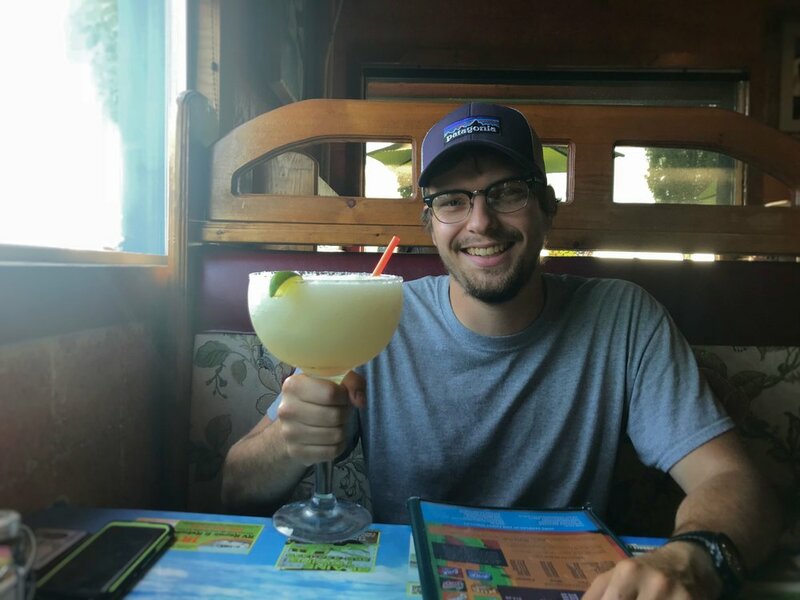 Ian ordered the Jumbo Margarita, and it was literally the size of his head. I ordered the pretty normal sized, Cadillac Margarita, which was the special that night. After the drinks arrived, the waiter informed me that my drink had even more alcohol in it than Ian’s! Fortunately the food came insanely fast and the portions were huge. Both our meals were delicious. Still after dinner, we had to walk those drinks off a bit. We headed down to the nearby Blaine Marine Park where we checked out some sculptures and watched the sunset from the beach. According to the parking laws of Blaine, WA, you can park on the streets in a recreational vehicle for up to 24 hours unless it’s otherwise marked. We successfully parked overnight on the street next to Blaine Marine Park. It wasn’t the most restful place to park though because there is a busy railroad nearby.